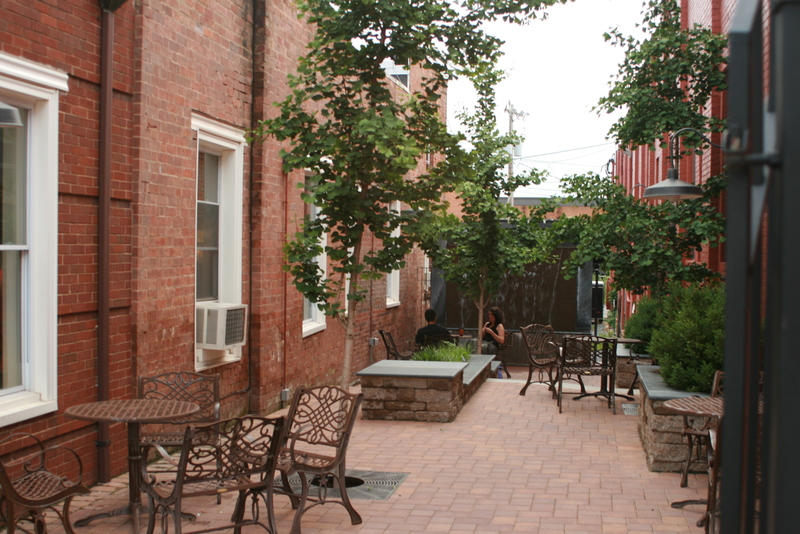 A fountain and gingko trees cool off this Harrisonburg pocket park. It’s going to be a real scorcher. While not everyone can spend the day on a shady river bank to wait out the record highs this week, you can seek out your own cool spot in your downtown district. 1. The historic theater. Summertime is a great time for an old-fashioned movie matinée. The daytime prices are cheaper, and those well-insulated theaters stay cool even in summer. Try Staunton’s Visulite, or the Radford Theater. 2. The ice cream stand. Linger with a cone or cup at your local ice cream stand or shop. In Harrisonburg cool off at Kline’s Dairy Bar, established in 1943. 3. The town breezy spot. Each community has a place where you can catch the breeze. In some towns, it’s an alley or street between buildings through which the wind funnels. In Martinsville, it’s the farmer’s market, where the currents crossing Baldwin Block are pretty reliable. 4. The shade of a street tree. Thank goodness for foresight, investment, and care that went into planting and maintaining shade trees along our streets. Find a bench in the shade, sit still for a bit, and wave at passersby. Old Town Manassas has created a great spot for this with last year’s streetscape improvements. 5. Local shops and restaurants. Merchants have their own ways of beating the heat–whether it’s frosty air conditioning or effective ceiling fans hung from tin-covered ceilings. Stop in and say hello. Lynchburg’s Market at Main combines the traditional lunch counter with well-selected goods in an inviting space. No matter where you are though, don’t over do it, drink lots of water, and check in on your elderly neighbors who may not fare as well in the heat. Send your recommendations for cool spots downtown to Doug.